BlueHarvest 5.5.5 – Disable DS_Store creation and more. Keep it clean. Blue Harvest does more than remove existing files — it blocks new ones from being created. Instant access. 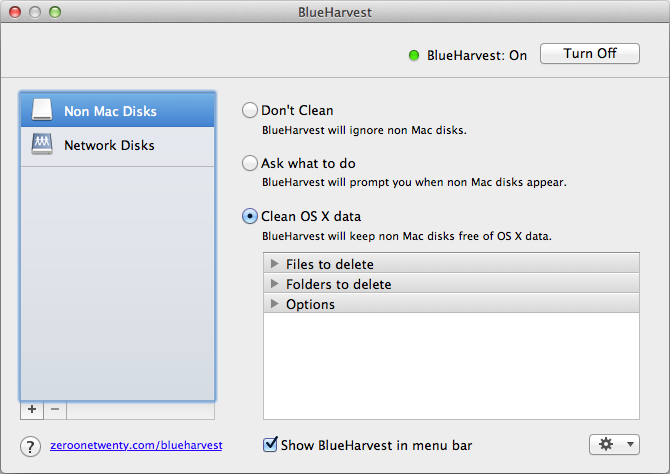 Want to clean up a folder without launching BlueHarvest? Simply control-click. Fixed a problem where some disks weren't asked to be cleaned. Next story GraphicConverter 8.8 – Graphics editor with powerful features. Previous story XtraFinder 0.17.2 – Add tabs and more to Finder. BlueHarvest 6.1.1 – Disable DS_Store creation and more. Tembo 1.8 – Quick and effective file search tool. Home Scan 1.05 – Connected Home Security Scanner.